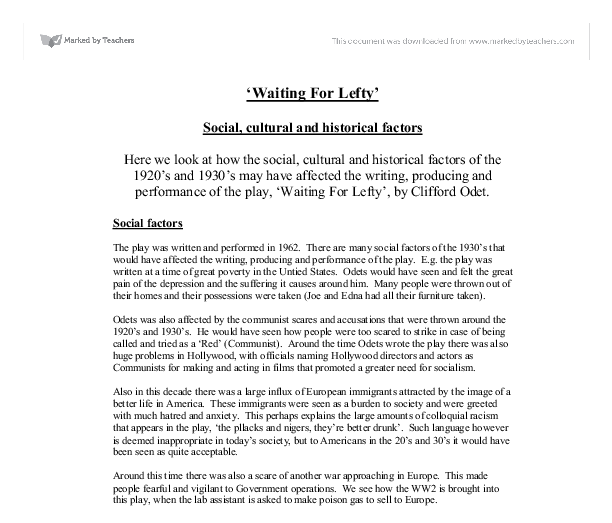 'Waiting For Lefty' Social, cultural and historical factors Here we look at how the social, cultural and historical factors of the 1920's and 1930's may have affected the writing, producing and performance of the play, 'Waiting For Lefty', by Clifford Odet. 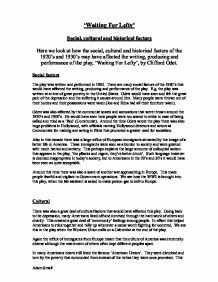 Social factors The play was written and performed in 1962. There are many social factors of the 1930's that would have affected the writing, producing and performance of the play. E.g. the play was written at a time of great poverty in the Untied States. Odets would have seen and felt the great pain of the depression and the suffering it causes around him. Many people were thrown out of their homes and their possessions were taken (Joe and Edna had all their furniture taken). Odets was also affected by the communist scares and accusations that were thrown around the 1920's and 1930's. He would have seen how people were too scared to strike in case of being called and tried as a 'Red' (Communist). Around the time Odets wrote the play there was also huge problems in Hollywood, with officials naming Hollywood directors and actors as Communists for making and acting in films that promoted a greater need for socialism. ...read more. This helped to dishearten faith in the Government but more importantly the Institution the country was built on. Odet must have felt that the country he once loved was falling apart due to government control and foolish propaganda schemes. This would have affected the producing and performance of the play, as the director would have wanted the actors to be able to relate to the peoples troubles so as to reveal the realism behind the plot. The actors would have also wanted the audience to be as disgusted with the poverty as they were so would have conveyed certain points as explicitly as they could. E.g. make the rich characters appear fat and slobbish. Historical The main historical factor that would have affected Clifford Odet's writing of the play would have probably been World War 1. Although the war had finished quite some years before, there would have still been evident, the loss and death caused by it. Many people were widowed or orphaned due to World War One so the tragedy of the event would have remained with the people who felt it. ...read more. I very much doubt that the audience would have even noticed the use of racist language in the play as it was so commonly used back then. As a direct result, actors performing the play nowadays would probably emphasize such phrases as 'Pollack's and niggers' so as to stir up emotions in the audience and to convey how racist some people back then were. From the position of a performer, I found it difficult to get into role as the characters in the play as their lives are so different to my own. Society as a whole has completely changed. The majority of characters in the play are uneducated, living in absolute poverty and can see no light at the end of their dark tunnel. They would have also seen the devastation caused by war and would fear any prospect of a future one. In comparison with today's society, which when confronted with a possible war in the Middle East only seems partially concerned or bothered by the prospect. It was for these reasons that I found it incredibly hard to relate to the lives of the 1920's characters. Adam Small ...read more. He shouts out the word "Ingerland" five times and then goes onto say, "It's ten o'clock. It's Saturday morning. I've had a hard week. I've been looking forward to this. It's Tunisia at Wembly. It's only a friendly. No it's not; there's more to it than that." The only reason he wants to take part or conclude in this show or want anything to do with people like that is merely because he makes a lot of money from it. The other important factor is the audience. As every Jo was saying the different lines like, 'You've killed me!' and 'it's all your fault!' We overlapped all of these lines which worked well especially as everyone was getting louder and louder, it gave the piece a real eerie feel. Individually I tried to follow this by slowly working through the scenes and therefore carefully attempting to develop my character and understand it fully. We specifically made the characters have there own unique speech and movement in the scenes we created. His products and his face dominate every medium. Although his exclusive retreats, personal seminars, and concert style lectures are very expensive, he makes himself accessible through books, and if the potential customer is not adept to reading he has each of his books on audio tapes and compact discs. Media evaluation on Multi cultural racism. The basic element of the narrative worked well, as the representation of the characters was easily understandable from the beginning and throughout the production. The characters used in the production have had previous acting experience, and this is evident in the final product, as they look professional, and performed well. In this piece my group showed the parents saying things to one another and we used the "Thoughts Aloud" technique again in between their spoken words. It really showed how what the parents were thinking was totally different to what they were actually saying. We were only told one detail about the person and we had to make a choice on that information. After we made our choice we were given more details and were able to change our mind which most of us did.